What are blackheads on nose? 1 What are blackheads on nose? According to US Library of Medicine, due to blockage of the hair follicles or skin pores present on the surface of the nose which cause development of black or brownish plug. This is termed as blackheads on nose. The recurrence of blackheads is frequent for those who maintain poor hygiene. In maximum cases untreated blackheads often turned to acne and pimples, as blockage of pores causes accumulation of dirt and also stagnant the flow of sebum. This leads to bacterial infection on the skin surface. If the bacteria and sebum are not contacted with air due to cessation of the pore opening, then it is whitish in color and termed as whiteheads and if the bacteria and sebum are connected with air through the opening of the pores, then blackheads is developed. Melanin the skin pigment present in the sebum which converts to blackish in color in the presence of air due to oxidation-reduction reaction. Thus blackheads become dark in color which cannot reduce by scrubbing. Blackheads are more common in the people who are in the age of puberty. In this age due to hormonal over activity, stimulation of sebum production increases and turn to skin oily. Oily skin is more susceptible towards blackheads development. In this condition topical oily makeup should be avoided, otherwise it worsens the problem. 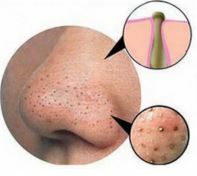 The cause of development of blackheads on nose is open comedone formation. The comedone is formed due to plug formation occurs at the opening of the skin pores. Skin pores are attached to the hair follicles, which secretes sebum. Sebum is the oily secretion of sebaceous glands. The sebaceous glands are present beneath the skin surface and help to hold the moisture at the surface of skin. Poor hygiene or insufficient cleaning of the skin causes comedone formation at the opening of the skin pores due to accumulation of dust or dead cells stuck in presence of sebum. The skin over the comedone when opened and air is in contact with comedone, and then they are converted to black bumps like structure which term as blackheads. Hormonal stimulation specifically during puberty, menstruation cycle, contraceptive pills. Certain medications such as corticosteroids, androgen and lithium have a tendency to produce blackheads and acne as side effects of the drug. 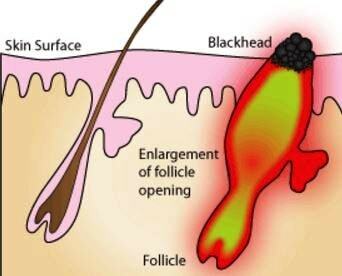 Certain disease conditions such as diabetes have the tendency to promote blackheads. Different OTC medicaments available in the pharmacy store which need not to provide any prescription for treating blackheads. These include ointment, cream and pad which can directly apply on the affected area of the skin. These formulations mainly contain salicylic acid, resorcinol and benzoyl peroxide. The mechanism of action of these medicaments for reduction of blackheads is bactericidal, dead skin removal and decrease sebum secretion. Dermatologist advice should be taken if the OTC products do not provide effective results. Usually prescribed medications contain vitamin A as a prime ingredient. Different available brands are tazarotene, adapalene and tretinoin. These medicaments help to remove the clogging of the skin pores and improve the new generation of the skin by accelerating the removing of the dead skin. These are topical formulation which has to apply directly on the affected area. Round loop extractor is an instrument which is used by dermatologist for removal of the clogs present at the blackheads. Dermatologists first made one small opening at the clog and then put pressure on the affected area by the extractor and remove the clog. Another technique for removal of blackheads dermatologist use microdermabrasion which contains a rough surface which rubs down the upper surface of the skin. Rubbing the skin helps to remove the plugs that causes blackheads. Chemical peels help to remove the dead skin and plugs which promote blackhead formation. In this process, a chemical solution topically applied on the affected skin, after an interval the upper layer of the skin peel off and an underlying smooth layer of skin become exposed. In this therapy, the ray or light is used to destroy bacteria or damage the oil producing glands for decreasing the oil secretion. In this technique the ray or light is reached directly on the underlying layer of the skin and does not affect the upper layer of the skin.